Folding?Soft-Bounce Rebounder has softer springs to create a softer surface for those who are looking for a softer bounce or for a person who is 300 pounds or less with the added benefit of a folding frame for travel or storage. Soft Bounce Rebounders are suited for professional athletes and have a maximum weight capacity of 300 pounds. 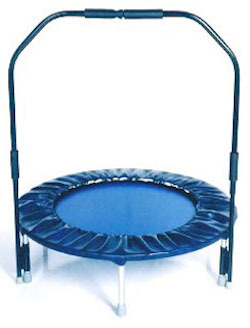 These mini-trampolines are great for indoor use during inclement weather and can be used by aerobics enthusiasts, people wanting to lose or maintain weight, as a lymphasizer, joggers, men, women and children.